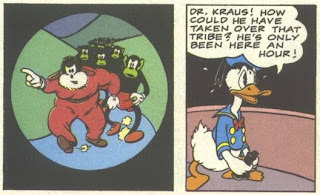 Duck Comics Revue: "The Secret of Mars"
Listen to my words, Boom people: you need to go back to prestige format for your Disney comics. I would understand why you would want to stay the course if your books were selling better than Gemstone's did, but that just ain't the case. And from an aesthetic standpoint, there are particular reasons why regular-length books are a bad idea for Disney comics in particular: if you're writing a superhero story, you can tailor it to the book's length requirements. No problem. 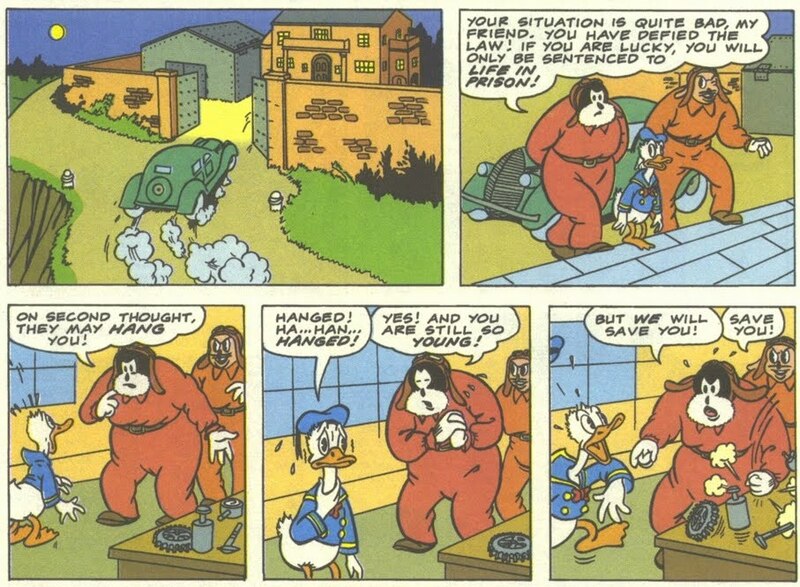 But Disney comics are a little different: they rely more or less exclusively on a mixture of reprints of old stories (from when comic books had more pages of actual comics) and European imports (which don't run on the same page-number system as US comics do). Therefore, more flexibility is called for, lengthwise. I have said on numerous occasions that I really appreciate your new direction, but let's face facts: until you go back to prestige format--at least for US and WDC, but even better for DD and MM as well--you're simply not gonna be able to hit Gemstonian heights. 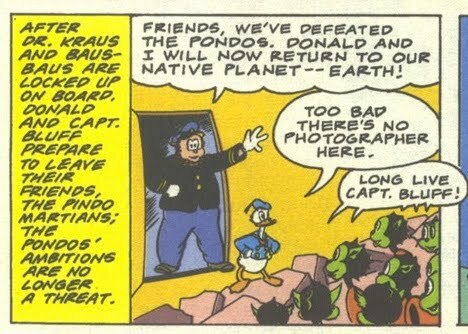 I say this because Donald Duck 364, which comes out today, features the long-awaited English debut of Federico Pedrocchi's 1938 story "Donald Duck Special Correspondent." But actually, it only includes the first installment of the story, which means I won't actually be reading it until next month, since I'd rather read the whole thing in one go. Grumph! Still, I thought that for this occasion, we could harken back to 1994, when Pedrocchi's first DD story--from 1937-8--was published in the US (in the sixtieth-anniversary issue, no less). The book in question includes an article by Bruce Hamilton that is very, very concerned--almost unnervingly so--with the question of whether or not this counts as Donald's "first comic book adventure" (spoiler: yes). So there's some serious historical value here; there's also some entertainment value, however (even if the two "values" may ultimately be inextricable). There's no denying that the story is a bit loose, and there are some pretty obvious plot holes, but I just really, really dig its feel--as the above-mentioned article notes, there's a strong Flash Gordon/Buck Rogers vibe to it. 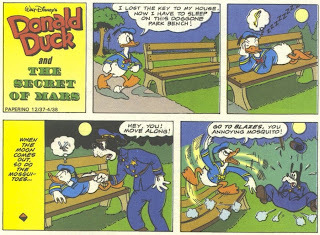 It has a completely different sensibility than later duck comics. In this instance, I am glad that the English script doesn't try to shoehorn in contemporary pop-culture references and the like--that would be very damaging to what's most appealing about the story. I hope "Special Correspondent" follows suit. You can see right from the beginning how different all this is--you've got yer primitive, narrow-beaked version of Donald; unlike the comic-book character of later years, it's easy to imagine him speaking in the cartoon "quacking" voice. Note also that there's a sort of dreamlike, disorienting atmosphere from the start, with our hero, having lost access to "home," sleeping outside on a brightly-moonlit night. Running away from the angry cop, he gets picked up by these two, who assure him that they'll save him from the gallows pole by taking him with them to Mars (?!). Please don't ask why they want him; that's not at all clear (they just want a general-purpose assistant, I suppose). This just adds to the story's surreality. Look how neat that is! The star-shaped stars make one think of something like The Little Prince, emphasizing the fictive nature of the story--in a good way. More cool stuff on Mars--since Donald accidentally smashed the spacesuits in a fit of rage, they send him out to see what's happenin' out there, and whether the atmosphere is breathable. Those landscapes are just plain nice! These aliens take him to their leader, who tells him the somewhat convoluted story of how he came to be where he is. Why Dr. Kraus wanted to go to Mars--how he knew about the title's "secret" in the first place--is not a question that is answered. ...speaking of questions that go unanswered. Acknowledging that the plot point doesn't make sense is not the same thing as addressing it, though in the larger scheme of things, this is a pretty minor bit of illogic. The secret! Donald gets tossed into this here Room of the Sun. The solar energy toughens him up, as it's known to do. 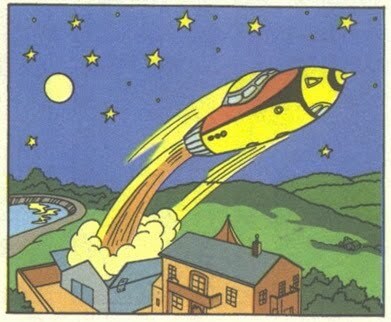 Again: another neat-o image. OH YEAH! That's just plain awesome. 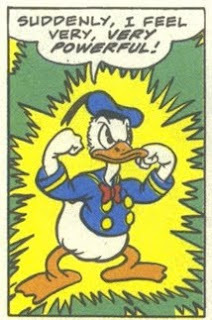 Donald had super-strength long before "Super Snooper!" As you expect, the villains and the bad aliens are defeated, the room is incidentally destroyed, and Donald and the Captain leave triumphant. The only thing that gives one pause is the question of why the pondos are "no longer a threat." Unless there's been some off-panel genocide, I fail to see why this would be the case. ...an' that's that. Two hundred dollars seems like a pretty penny-ante reward for apprehending such long-term desperadoes, but what do I know? If we had somehow forgotten that this was a pre-Barksian Donald, the fact that the story ends with a flurry of angry quacking should remind us right quick. It is a fun story. I like it. Apparently, Gladstone had to go to a lot of trouble to find it and clean it up for the US printing, for which I applaud them. However, it seems they were a bit overly optimistic about the interest it would arouse: "The film for this story is likely to be requested by other Disney publishers around the world," Hamilton asserts. Not so, per Inducks, according to which this is the only contemporary publication outside of Italy (it was published in Polish back in 38, but that's the only other language its listed as having appeared in). A genuine shame. As for Pedrocchi, sadly, he was killed in an air raid in 1945, at the age of thirty-seven. If the Gladstone article is to be believed (and I don't know why it wouldn't be), inducks' list of his stories is woefully incomplete. However, it is I believe accurate that he only wrote and drew three stories--this, "Special Correspondent," and something intriguingly called "Donald and the Philosopher's Stone, which has ne'r been published outside of Italy. You know what I'm going to say, right? Get on it, Boom! From the article about "The Secret of Mars," I am cognizant of the difficulties involved, but the payoff is that it would be super awesome. Also, Barks' "Fabulous Philosopher's Stone" is set to be reprinted in US402--wouldn't it be cool to have this other story as a companion piece? You bet it would! Let's honor Pedrocchi's tragically-shortened career by bringing more of his work to a contemporary audience, shall we? Update: My article on "Donald Duck, Special Correspondent" is up. Why are you saying that "inducks' list of his stories is woefully incomplete"? I could bet that it _is_ complete. Well, inducks doesn't list him as having done anything past 1940. Whereas, according to the Gladstone writeup, after he was discharged from the army in 1943, he "continue[d] to contribute stories to Mondadori's comics magazines. . . . he [was] such a prolific writer . . . that the stories he had written [before his death] continued to appear in comics until 1947." 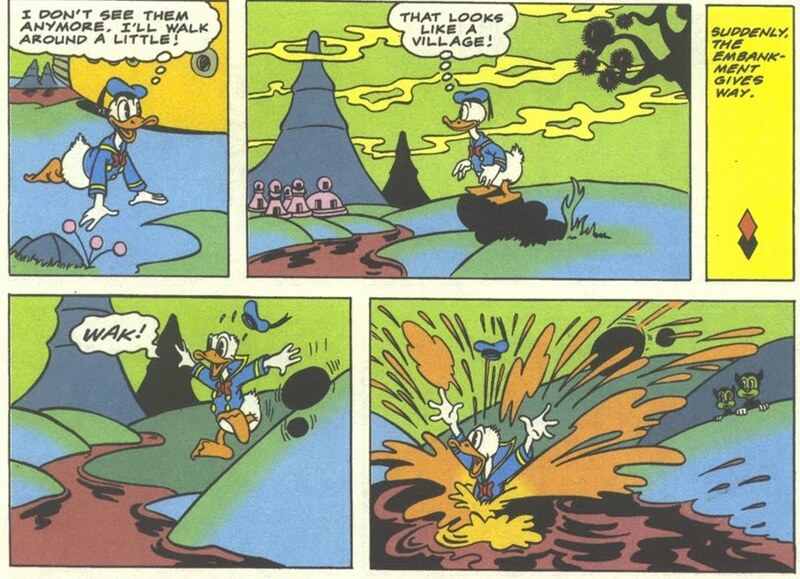 Granted, I believe "Mondadori's comics magazines" does include non-Disney stuff, but it strikes me as unlikely that he did *nothing* else Disney-related after 1940. Of course, I could be mistaken. I’ve been waiting for “Special Correspondent” ever since reading “The Secret of Mars”! Bring on “The Philosopher’s Stone! GeoX: I've asked for confirmation, but I'm almost certain that you are wonrg and that Inducks is right. Pedrocchi most likely did nothing else Disney related. 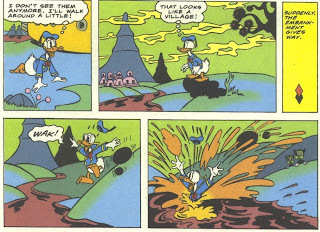 We should not forget that Disney was an American brand whereas Italy was among the axe powers - even though Topolino was still distributed in Italy in the early 1940s just like in France in Marseille. Hi again. What I wrote is now confirmed 100%. The list in Inducks is complete. 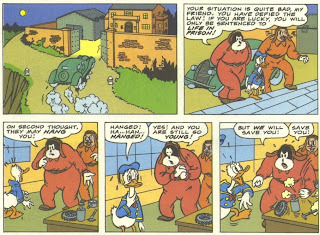 Geo, Inducks actually lists pretty much EVERY Disney comics. Things that aren't there (some 40s Egyptian or Argentinian stories?) are really obscure stuff. Okay, okay. Yeesh. But let's not overstate inducks's infallibility, shall we? You don't have to spend a lot of time browsing by country to realize that there's a LOT of unindexed material out there. Many _reprints_ are missing, but probably not so many (original) stories. "Special Correspondent" reads like a Gottfredson MICKEY story with Donald and Peter Pig filling the Mouse-placeholder. "Secret of Mars" was good, but this story has its feet planted on the ground a bit more firmly. I'd like to see "Philosopher's Stone", as well. Bam! Filibuster-proof majority! I'm pretty sure Boom is now legally required to localize "The Philosopher's Stone." hi, another anonymous here, also in favor of localizing "The Philosopher's Stone". great article, I have to read it! I am italian, but since I did not follow so much US comics in the mid-1990s I wasn’t aware of the US edition of the Mars story. As a reply to whom was asking about Pedrocchi’s production, besides "Special correspondent" which you already mentioned, there are other seven stories, some excellently drawn by Enrico Mario Pinochi. 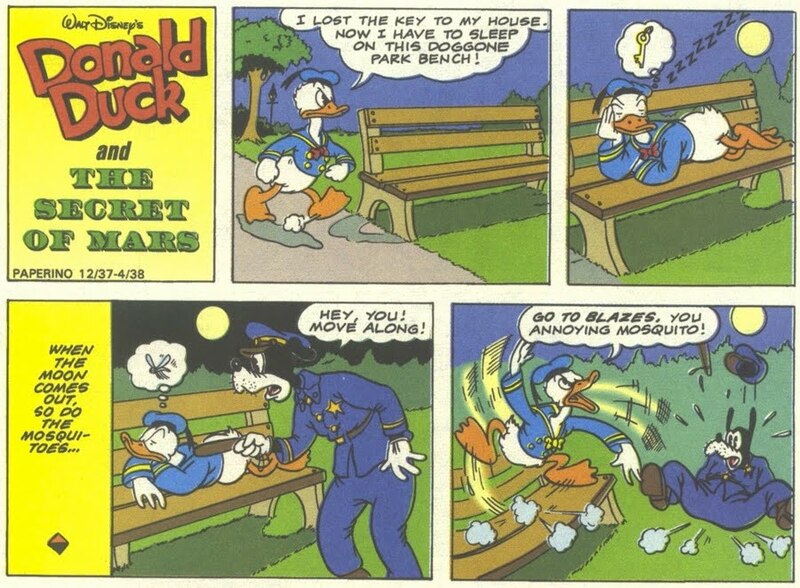 It's the Led Zeppelin IV of duck comics!